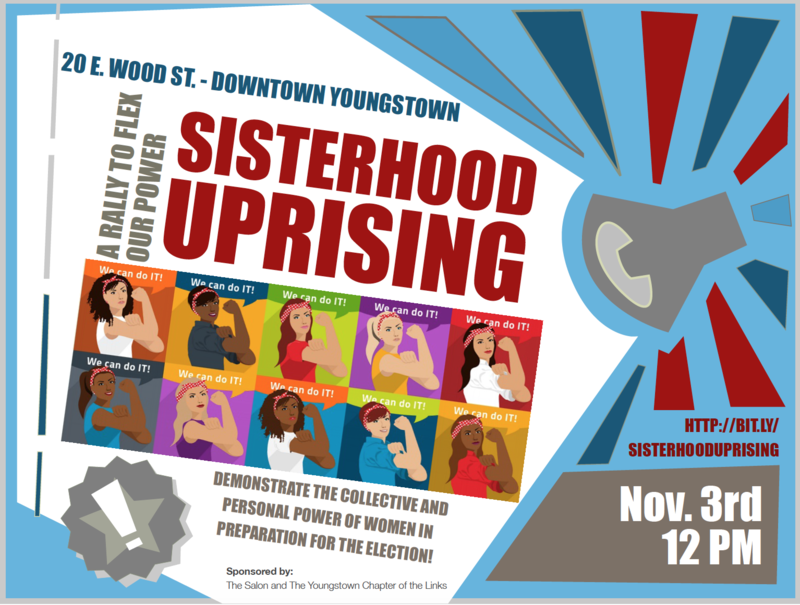 A collective of women’s organizations are pleased to announce the Sisterhood Uprising, a rally to Flex Our Power on November 3, 2018 at noon. The rally will begin with a march from 20 E. Wood Street, Youngstown, Ohio to the Mahoning County Courthouse at 120 Market Street. The March and rally are designed to demonstrate the collective and personal power of women in the community in preparation for the upcoming election. The rally encourages each woman and her allies to exercise their strength in numbers at the voting booth. The Salon, and the Youngstown Chapter of The Links have pooled their resources along with a number of local congregations to organize the rally to maximize voter enthusiasm and engagement for the midterm elections. Speakers will present on issues of concern to women, including the renewal of the Federal Violence Against Women Act and Equal Pay legislation. Recent events in Washington have energized women and the rally provides an opportunity for diverse groups to meet and strategize for future involvement with local and state officials. Media Point person for the rally is Attorney Kim Akins. Her contact information is khia213@yahoo.com or 330-272-1579. The Facebook Event can be found at http://bit.ly/sisterhooduprising.